New Possibilities is a dynamic, creative and inspiring company that takes pride in the relationships that are built with customers. These relationships are built on trust and understanding. Your first point of contact will either be with Greg Fennell, the business manager or Anna Geyer, company director.We will have a conversation with you to understand what you are looking for and offer suggestions as to how best we can support your desired outcomes. Seeking to understand individuals, and respond accordingly. Valuing and acknowledging diversity of thought and the richness that it offers when looking for innovative solutions. Representing that diversity in an open, honest and transparent way. The experience of using New Possibilities Services will be reliable, efficient and hassle free! "MutualGain has worked with Anna and her team on many occasions. 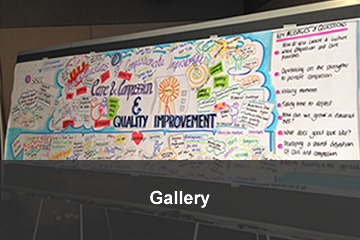 Anna has provided visual minutes at our community engagement events including World Cafes, Appreciative Inquiry and Asset Mapping events. Anna and her team provide a high standard of professionalism, flexibility and quality service. 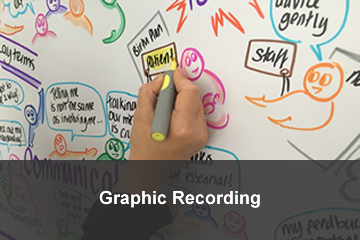 If you are looking to have a meeting or event recorded via visual minutes, then I would highly recommend Anna and her team"
"I work regularly with Anna and she is brilliant. Anna says that graphic recording our 'Whose Shoes' workshops is the hardest thing she does. Our participants literally bombard her with post-it notes. She themes them live, and is always ready to report back key messages... cool as a cucumber. She is imaginative, inclusive and really listens to what people are saying. 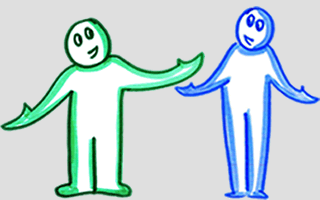 - In short, I love working with Anna and the added value graphic recording brings to my Whose Shoes work." Creator of 'Whose Shoes?® - Making It Real' co-production tool. 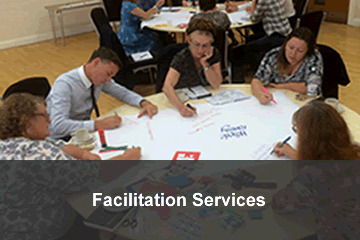 A catalyst for change in health & social care.